Unlike Humans, Octopus Blood Is Not Iron-Based But? Heroin Was Originally Marketed As What? Life in the ocean requires creatures to make all sorts of adaptations for everything from the cold, to the pressure, to the salinity, and the octopus is no exception. 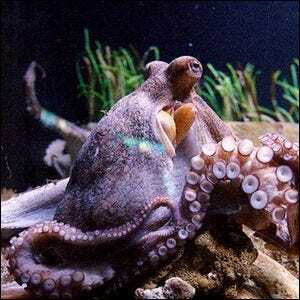 Unlike humans (and most other creatures for that matter), octopuses don’t have red blood, but blue. Our blood is red because of the iron-based hemoglobin molecules within it. Octopuses, on the other hand, have hemocyanin which is like our iron-rich blood, but the iron atoms are replaced with copper. The copper-based blood molecules are more efficient at transporting oxygen when the temperature and oxygen levels are low, an adaptation well suited for life in the deep and cold waters of Earth’s oceans. There is, however, one downside to this adaptation–they are, as a result of it, very sensitive to changes in the pH value of the water around them. With that in mind, many scientists are concerned about trends in ocean acidification and the impact it will have on octopus populations.